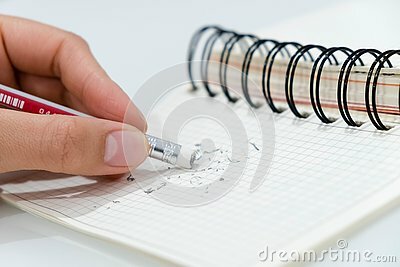 Pencil eraser, pencil eraser removing a written mistake on a piece of paper, delete, correct, and mistake concept. School and drawing supplies, on wooden table. Exercises book, colored pencils, eraser, pencil and ruler. Notebook and pen on blue background. Planning concept. Education concept, copy space. Business office concept. Empty workplace. Paper topic:a stapler, pencils and sharpener.